GM 2350, Lot 5910, Persiaran Raja Muda Musa, 41200 Klang, Selangor, Malaysia. 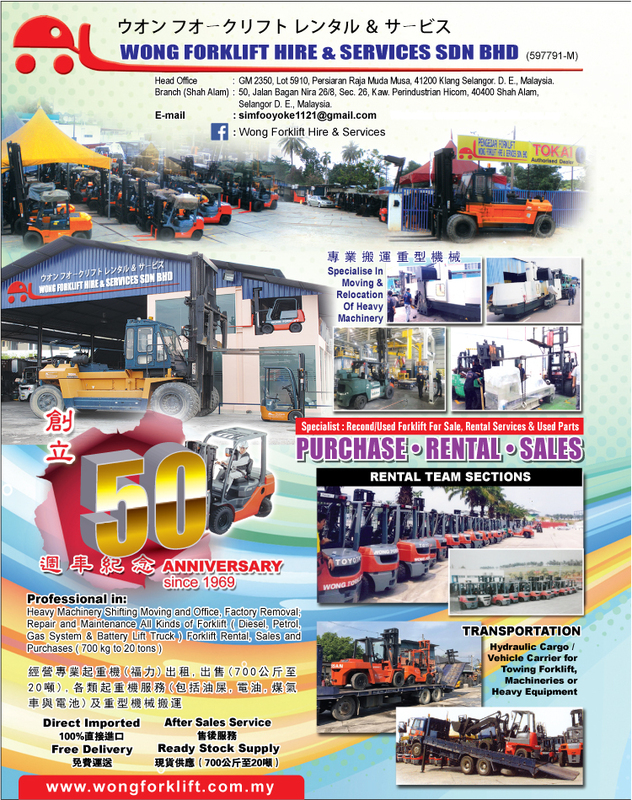 Started in 1969, Wong Forklift has grown leaps and bounds over nearly five decades to become a partner of choice by thousands of customers in Malaysia. Our mission is simple: to provide the best solutions to our clients in meeting their operational requirements- to reduce their manpower, cycle time while increasing their productivity. How do we that? By supplying only products of the highest quality along with a dependable maintenance and servicing program. Our machines have been trusted by our clients for a variety of purposes across countless industries-warehousing, construction and many more. Our forklifts come in a variety of design, functionalities and capabilities ranging from 700kg to 20 tonnes. Call us today for a free consultation or come over to view for yourself the broad range of vehicles we have in store. 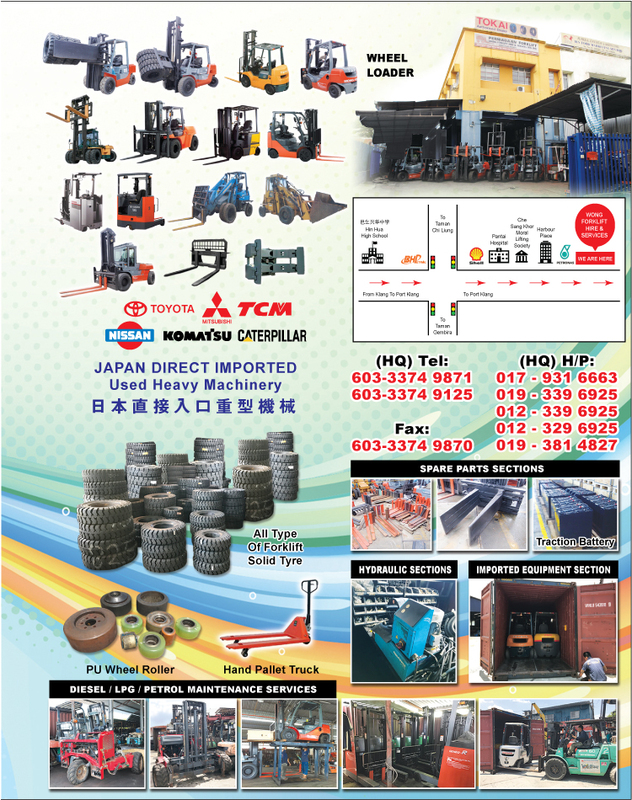 Over our years of operations, we have established an extensive global network and have traded in forklift trucks across the world with imports of at least ten (10) containers of forklift trucks into Malaysia every month. Our reconditioned forklift trucks are of high quality and are fully imported with warranty and support from Japan, including brands such as Toyota, Mitsubishi, TCM, Nissan, Komatsu etc. Installment plans are available – we will gladly advise you and offer you a fitting solution to your requirement. All purchased vehicles are tested and inspected. Customers are also allowed to carefully test drive the forklift trucks before making a purchase. We invite you to pay us a visit at our warehouse and our personnel will show and explain the features of each vehicle. You will receive extensive, reliable information about the condition and value of the forklift trucks which will enable you to make a fully informed decision. Likewise, we also welcome any forklifts for sale or trading. Our extensive global network enables us to connect to interested buyers across the world. Please contact us or visit us at our office and we are more than happy to provide our assistance. Our warehouse is equipped with the facilities and infrastructure, as well as the skilled employees, for the refurbishment, servicing and repair of local and imported, new and used forklift trucks. Whether it is diesel, LPG, petrol, battery-operated forklifts, or reach trucks, motorised power trucks, stackers, or even hand pallet trucks, we have the skill, expertise and knowledge to handle it. Just leave your materials handling problem to us to focus on other aspects of your business. We pride ourselves with our experience in the trade, efficiency in our service and operations, on time deliveries and reliability while maintaining our personal touch at the same time. We value the trust of our customers and that is why we conduct our business in an honest and forthcoming manner.